Nathaniel Sackett, son of Nathaniel Sackett and Mary Rogers, was born on 21 October 1768.1 He died aged 84 in Monroe, Butler County, OhioG, on 5 June 1854 and was buried at Monroe CemeteryG.2,3 He married first in about 1792, Elizabeth TerBoss, daughter of Jacob Terboss Jr. and Sarah Dubois.1 Elizabeth died in MonroeG in 1822. He married second Jane Stitt. Charles Weygant, The Sacketts of America, "463. Nathaniel Sackett, b. Oct. 21, 1769; m. Elizabeth Ter Boss." 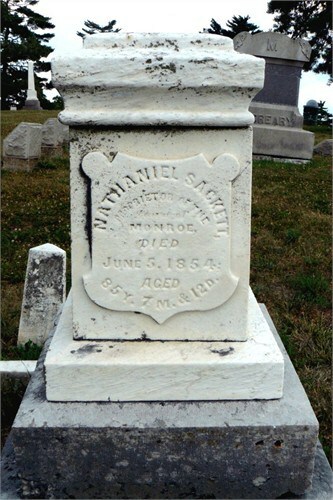 Website Find A Grave (http://www.findagrave.com), Monroe Cemetery, Butler County, Ohio, "Nathaniel Sackett / Proprietor of the Town of Monroe / Died June 5, 1854 / Aged 85y 7m & 12d." Age at death, 85y 7m 12d, calculates to a birth date of 24 Oct 1768. Weygant had 21 Oct 1769.